Red Fish, Black Fish, Blue Fish, Spanish Fish…Just some of the marquee species anglers are targeting as we approach Labor Day weekend. As long as the weather cooperates, you should do well this holiday, too. 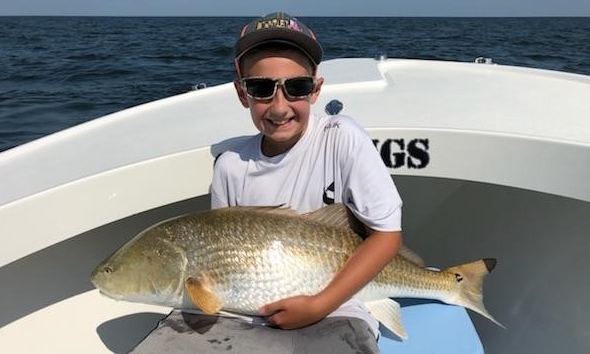 Maryland Coastal Conservation Association youth members recently locked up with some bull red drum and cobia on the lower Chesapeake. Avid angler and founding member of the Women’s Offshore Alliance fishing team Jaime Buffington says, “Good fish karma struck CCA Maryland youth members Nick Long, Ayden Smith and Hunter Buffington while fishing with their dads on the lower Chesapeake. The young men have contributed to CCA’s Living Reef Action Campaign, which works to improve fish habitat. It looks like the fish appreciate the effort, rewarding them with an experience they will carry with them for a long time.” Pretty work, fellas. with their hefty, light-tackle catches. It’s possible I’m running past the fish, but my guess is the freshwater wedge continues to keep salinity below typical levels, and therefore, the bluefish and Spanish mackerel remain well below Bloody Point. Yesterday, I searched nearly 40 miles and found nary a one. Best recent spots are False Channel (thanks Captain Drew on Big Worm), and the Calvert Cliffs Power Plant to Parker’s Creek. Mike Carter found a trophy, 27-inch, 4-pound, 5-ounce Spanish mackerel, which he caught and released while fishing on breaking fish near the Power Plant. The mack hit a slow-retrieved, four-inch Z-man DieZel Minnow in opening night color pinned to a half-ounce jig-head. Spanish mackerel can often be found swimming with bluefish, and they’ll hit trolled spoons or cast plugs such as a gold Got-Cha lure. Soft plastics baits also work. Spanish mackerel are delicious smoked or baked fresh, but they don’t freeze well. In the year-long Virginia Saltwater Fishing Tournament, Paul McCallum Sr. of Hampton is the king mackerel leader with a 47-pounder he decked while chumming off of Sandbridge. Another tarpon was caught seaside, though sadly, the photos of this huge fish appear as if the fish had expired. Cobia fishing remains pretty good, and some anglers, including clients of guide Captain Chris Newsome, are catching them on the fly, which is anything but easy. Flounder catches, especially for big ones, continues to improve on the CBBT structure. In the Virginia Beach Billfish Tournament, congratulations go to Captain Barry Sawyer, angler Ed Groce and the Waste Knot crew for their 683-pound blue marlin. In the upper Bay, live lining and jigging scores keeper stripers. Like others, I have been enjoying an early morning bite around the quiet-waters next to current rips at Hail Point, Thomas Point, Poplar Island and the like. Off Annapolis, in the freighter anchorage, you may find breaking rock late in the day. The black drum are still around. I’ve heard of two caught recently—Podickory Point and Hail Point. Peeler crab is always a good choice. Almost all of the reefs and wrecks off of Ocean City, Wachapreague and Indian River Inlet have a good mix of flounder, bluefish, sheepshead and, sometimes, triggerfish. Sea bass fans are happy there’s no closure this Fall. In freshwater news, Marty’s Bait & Tackle shop-owner Jim Bieler shared that Colin Miller caught and released a 32-inch muskie that hit a black Mepp’s Fury #5 on the upper Potomac. DNR reports Kevin Willinghan of Fallston, MD caught and released a 40-inch muskie while smallmouth bass fishing on the Conowingo Reservoir. Solid snakeheads reports come from the Sassafrass, lower Susquehanna, Wicomico and Blackwater rivers. Toss crankbaits, rubber frogs and flukes over grass or near deep structure. Friend and expert snakehead angler Joe Bruce recommends fishing the warmer part of the day. Counter-intuitive to me, but the man knows snakeheads.